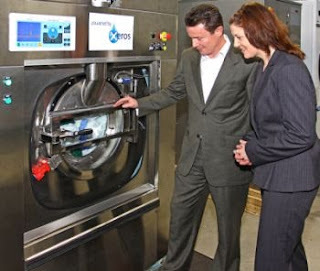 An almost waterless laundry cleaning system is the latest world-beating innovation to be associated with the UK’s only dedicated Advanced Manufacturing Park (AMP) in South Yorkshire. Xeros Ltd is developing the world’s first “virtually waterless” washing machines at its new environmentally efficient unit at Evolution @ the AMP in Rotherham. The park is a joint venture between Yorkshire Forward and UK Coal, while the Evolution scheme has been developed by UK Strategic Partnership. The technology has been developed over the past 30 years by textile chemistry professor Stephen Burkinshaw at the University of Leeds. Spinout company Xeros has undertaken the commercialisation of the process at its laboratories in Leeds. The decision to move operations to the Park was made as Xeros focuses on discussions with commercial partners in a bid to break into the global laundry products market - expected to reach around $50 billion this year. The new washers will re-use polymer beads which act as a cleaning agent to remove dirt from clothes. The Xeros process saves up to 90 per cent of water compared to conventional washing machines. Taking US domestic washing as an example, that translates into 1.2 billion tonnes of water saved per year, equivalent to 17 million swimming pools. The system also has the potential to dramatically cut carbon emissions because far less electricity and detergent is required than in conventional machines. Xeros aims to have a commercially viable product ready for the end of 2010. Its first target will be the commercial washing market, including hotels, care homes, and high street washing outlets. It also plans to license the technology to domestic machine manufacturers, enabling them to capture the considerably larger domestic market. Acting for Evolution owner UK Strategic Partnership, Knight Frank successfully negotiated the lease of the 2,427 sq ft unit. Yorkshire Forward provided funding towards the cost of the fit-out for the new unit, while additional grants for company development have been secured through South Yorkshire Investment Fund (SYIF). The Park is on the Rotherham-Sheffield border, in Rotherham’s Waverley area, just off the M1’s Junction 33. It is a joint venture between public and private sector organisations, including regional development agency Yorkshire Forward and land-owner UK Coal, creating an internationally recognised centre for engineering, innovation, research and manufacturing excellence. Its development opportunities range from small office, workshop and lab space, through medium-sized hybrid and light industrial units to larger custom-built design and build options.